Little steps to heaven | A Catholic knitting & sewing mom…. A Catholic knitting & sewing mom…. 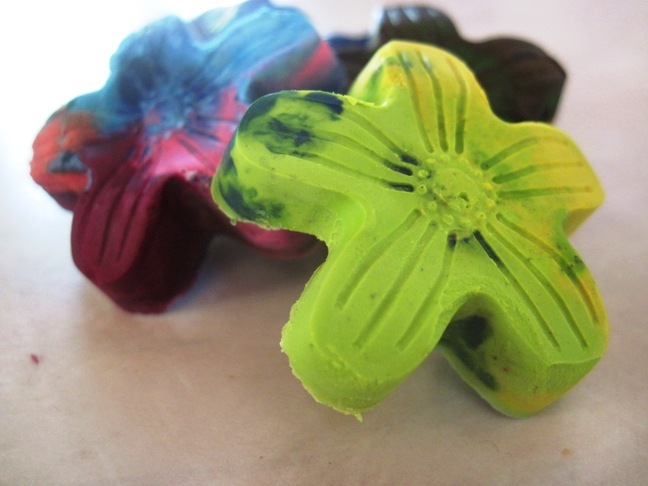 Yes, I will admit I make my own laundry soap! I officially made the switch April 5th and have been going strong ever since. I had been using soap nuts, which seems to work okay for regular clothes, but was not working well for my cloth diapers at all. So then I went to Rockin’ Green for my diapers and Soap Nuts for the clothes. That seemed to do the trick, but it was a bit pricey ($16 for 90 loads) just for a couple of loads a week. I wanted something that could be used for both! So I hunted down the Dugger recipe (I’m sure you’ve heard of the family, 19 kids….) and tried it out. So here’s my take on it! 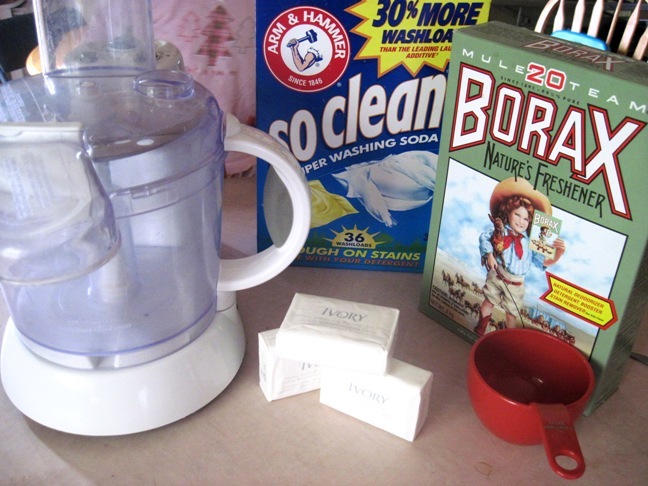 There are only 3 ingredients: 1 cup Borax, 1 cup Washing Soda (not baking soda…) and 1 and 1/2 bars of soap. They recommended using a specific type of soap that I cannot get here, so I went with Ivory Soap. 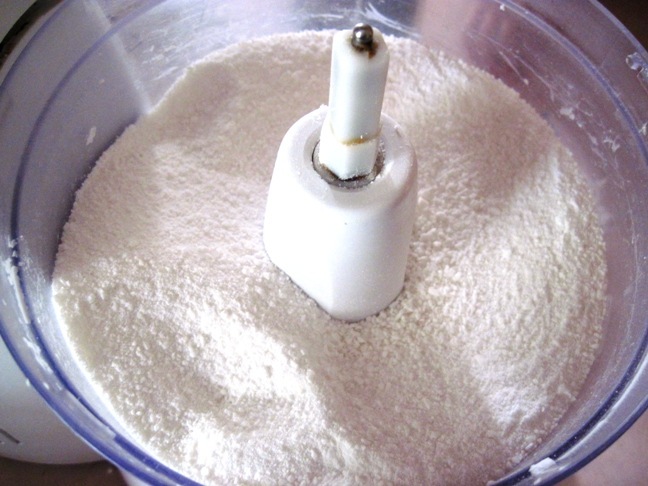 First grate the soap (much handier if you use a food processor, make sure to REALLY wash well after using), then add the Borax, Washing Soda, and grated soap into the food processor and pulverize until it looks like laundry detergent. You can add a scent (although I haven’t yet) to customize your laundry wants. Total time to do this (including running downstairs to get the ingredients) 5min. Now for a breakdown in costs. Okay, now if my math is right (using all sorts of conversion such as cups to oz to kg, etc….) it cost roughly $1.96 to make 1 batch of laundry soap. How long does it last? It all depends on how much you do laundry! I do laundry roughly 11 times a week (6 people and 1 is in cloth diapers) and use between 1 – 2 tbsp per load. The first batch lasted me about a month, which is around 60 loads of laundry. The last time I went to the grocery store I priced out powdered detergent for the same amount of loads which came out to $8.98 (This is the cheapest no name brand I found, it can go up from there) A minimum savings of $7.02! If you want your savings to go even further you make this into a liquid. I haven’t done that yet because I don’t own a big enough bucket. Of course you can always wait for these items to go on sale and get an even better deal. 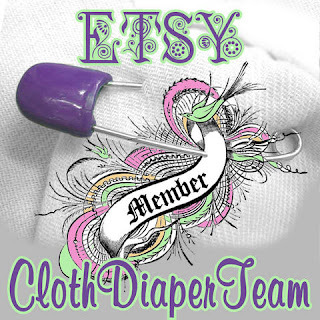 The results: So far it has been working great with my cloth diapers. No stink issues and I haven’t had to strip them either. When I was using the Rockin’ Green I would have to strip them every other week. As for the regular clothes, it does an ‘okay’ job. I have to admit it doesn’t get the kids stains out as good as I hoped, but then again I”m really bad about pre-treating stains. 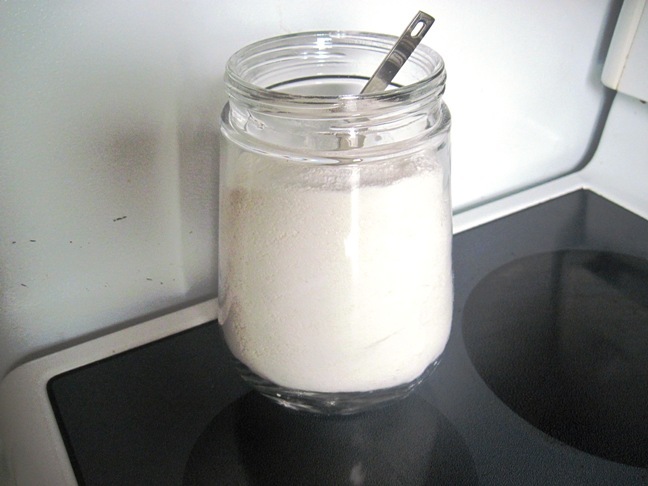 Although when I do a combo of borax/baking soda/vinegar it seems to do the job…I just have to remember to do it BEFORE I wash the clothes. Oh, I forgot to mention that I have a front loading washing machine…..
Any thoughts? Ideas? Suggestions? Now go out there and start saving money!! It’s important for moms to recognize that all the small successes in our days can add up to one big triumph. So on Thursday of each week, we do exactly that. Sherri at Chocolate for your brain has graciously agreed to host this over at her blog. 1 – Finished Marie’s First Communion / Confirmation Dress this past weekend. I cut it close, she receives first Holy Eucharist / Confirmation on Monday! Don’t worry, there will be a blog post about it – I guarantee 🙂 Yes, you did read that right. The kids in our diocese receive both sacraments at the same time (at around age 7 or 8). It’s something that the previous Bishop changed to ensure that the kids were receiving their sacraments. Not many High School kids were getting confirmed. 3 – An update to my last small success, I did finish the 40 bags for 40 days…but only got about 1/2 way there. But I did take all the donation bags down to the CWL the week after Easter, so that was a HUGE success. Also, got about 1/2 way through the Psalms. I’m thinking I need to pick something a little less ‘dry’ to read in the Bible. Maybe I’ll go through the Gospels again. 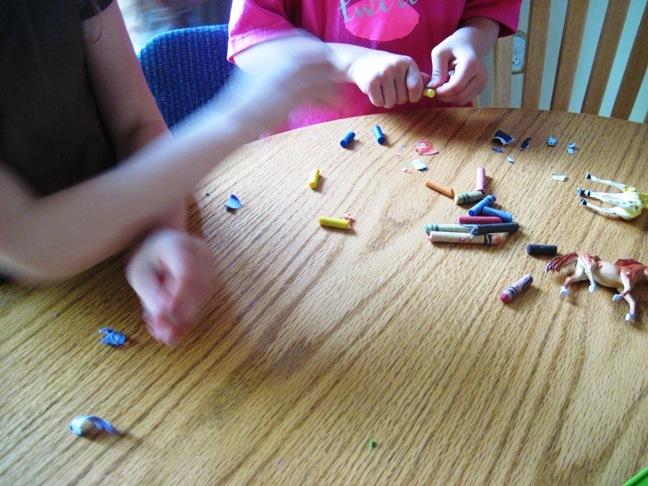 I read on a blog recently on how to re-use your old broken up crayons and make them into new, fun and exciting crayons. Yes, I’ve got 4 kids and have TONS of broken bits of crayons. So I figured I would try this out. First, have the kids peel all the paper off the broken bits and break them into smaller pieces. That actually kept them busy for about 10min! 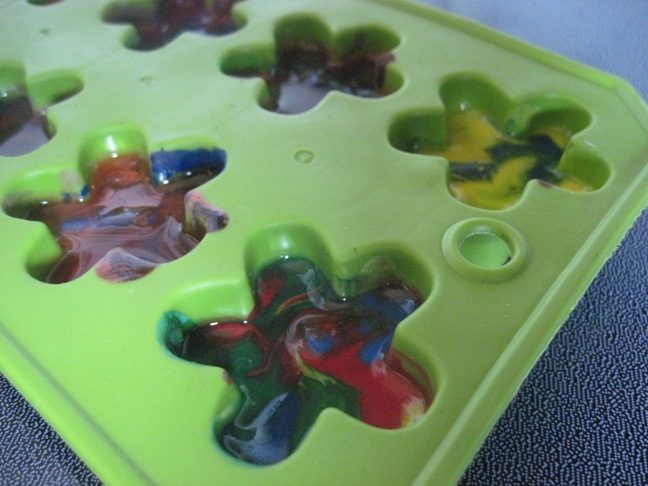 Then stick all the broken bits into a mold of your choice. I found this one at Extra Foods for $2. 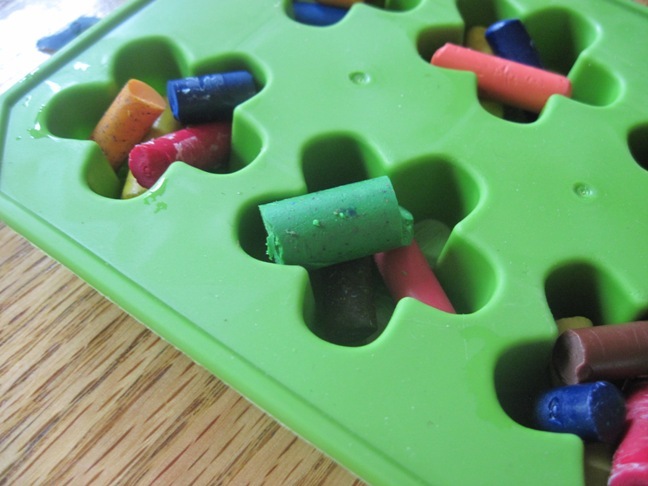 I think its a silicone ice cube tray? But it seemed to do the trick. Next, I heated the oven to 170 degrees C, 200 degrees C, finally 250 degrees C (Yes, I was getting impatient because the darn crayons were not melting) and let them sit there for 2 min at a time constantly checking on their meltedness. (Is that a word?) Finally they were melted, took them out and stuck them in the freezer to cool down. I think I may have popped them out of the mold too soon because half of them broke! But the ones that made it looked pretty cool. And besides you can always melt them down again and make new ones! And Hannah had no problems jumping in right away and colouring with them 🙂 So if you’re looking for something to do on a cool and rainy Sunday, this is the perfect trick! Action Drawing. 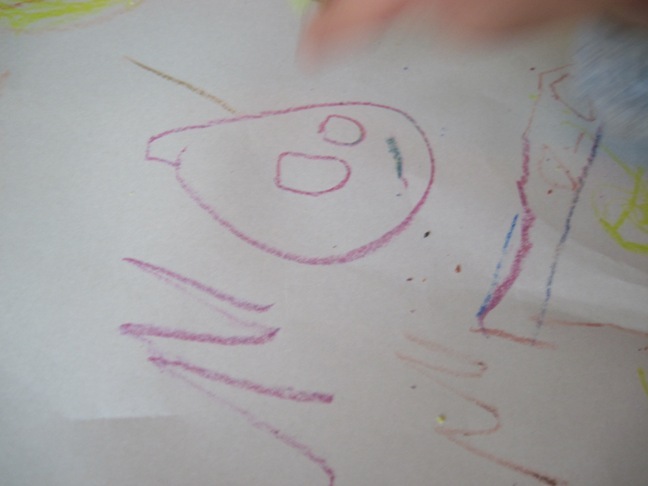 This is Hannah's Potato Head Monster. I know I haven’t been posting much lately, well I do have a reason……On May 6th we were expecting our 5th baby to be born just before Christmas, we were so happy but also scared because we would officially be moving into the ‘larger’ family club. Less than a week later, we were burying the remains of our 7wk, 3 day old with the help of our former parish priest. This was the second miscarriage I’ve experienced. The first one happened Sept 1st, 2002, only a few months after we were married. I don’t remember much about it. Not too much physical pain, but mostly emotional pain and anger. Now that I’ve had 4 living children, this one really hit us hard. Over the years, my husband and I know and understand more about our Catholic Faith, so we really wanted to be sure that we did everything that we were supposed too for this lost child. We turned to the EWTN Q & A website, Catholic answers and any other websites that we could find on miscarriages. The hardest part was telling my oldest daughter. She’s almost 8, and was overjoyed at the possibility of another sibling, but when we told her we lost the baby she was devestated. We reassured her that we had another Saint in Heaven watching over us and praying for us and that made her feel better. Now that it has been almost a month since we lost the baby, and I’m starting to feel a bit better emotionally. Who knows what God has in store for us? A bigger family? Who knows, we are just trying to say yes to his will…one day at a time. I hope this post can help others who may be suffering or have suffered a miscarriage. It’s important for moms to recognize that all the small successes in our days can add up to one big triumph. So on Thursday of each week, we do exactly that. 1 – I cleaned and purged…MY ROOM! I can finally see my dresser top, the closet floor and even my bathroom drawer. Unfortunately the master bedroom had become a dumping ground for everything. It’s good to gain back a bedroom. 2- The 40 bags for 40 days is slowly coming along. (See above) I think I got 3 bags alone in my own room. How about you? Come share your small successes at Faith and Family Live. Wow, I can’t believe it’s been so long since I’ve posted any successes. Our whole family has been down and out with horrible colds this last month. It really put a damper on some of the extras that I was trying to do. I’m hoping to get back into blogging on a bit more of a regular basis. 1 – I actually prepared our Lenten activities this year. Last year we were several days into Lent without anything on the go, so this year I did some research and got everything ready to begin on Ash Wed. We are doing the Holy Hereos Lenten Adventure, Lenten Calender from here (BTW I LOVE Catholic Icing), Sacrifice jar and I purchased the Stations of the cross CD from Holy Hereos. We are still waiting on the cd, but I hope to begin it next week. 2 – Socks, oh how I loath thee. You may remember my previous posts about socks. I seriously think they were created to give me a headache. It wouldn’t be so bad if it was my husband and I who wore them, but my 3 girls absolutely dispise wearing them. Even in the dead of winter when it is 40 below. I put the socks on them in the morning, and as soon as they get the chance, off they come. Do you have this problem? So when I go to wash the little things I end up with missing pairs. I even started a missing sock bin on my dresser. It was overflowing and spilling onto the floor. Well I managed to match many pairs of socks and am now down to just a mere few. I think the rest are hiding in the van…. 3 – My own Lenten journey. I really have to get into reading scripture again, so I’m going to try and tackle the Psalms. Any suggestions for me? That and add an extra mass during the week. For the last two months we haven’t been able to make it to our daily mass on Wednesday and it’s really starting to show. Luckily everyone is healthy again, and our parish priest is back from his retreat and vacation, so it’s back to mass we go starting next week 🙂 I’m also going to try the 40 bags for 40 days. We could all do with a lot less stuff (especially me). Share your small successes over at Faith and Family live. 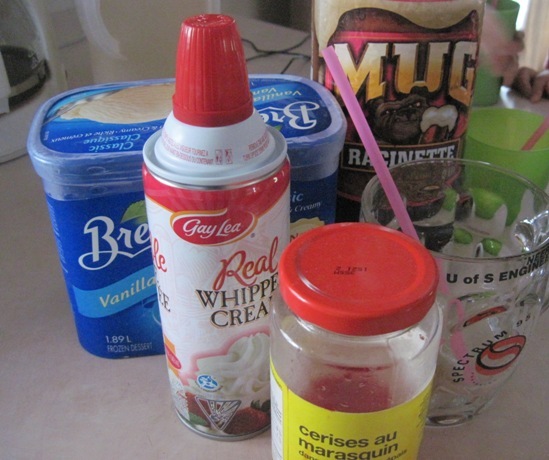 This year we did yummy rootbeer floats. Easy and quick! It was so delicious! Next we made some Mardi Gras masks. The girls really liked doing this one. I gathered all my supplies at the local dollar store. They even had some great sparkly adhesive foam sheets. Here is Therese decorating her mask. And finally Hannah with her mask. Nicholas is a bit too young to be playing with such small beads & stickers so I made up this one for him. Here are the girls showing off their Mardi Gras masks. May your Lenten journey be fruitful!